Three winners will be chosen. Each winner will be individually featured on one of three covers of the 2014 Cherry Hill Community Magazine along with an “About the Image” piece inside the magazine. Winning photos will also be displayed during the 2013 Fall Into the Arts Juried Photography Show at Croft Farm. Winning photographs will be available for sale to the general public (optional). - Winning photographers will be required to print, mat, frame and wire for hanging their submissions for display during Fall Into the Arts (October 12-26, 2013). - Photographs may be submitted to Arts@CHTownship.com as attachments by email? ONLY and must be received by 4:30 p.m. on Wednesday, September 13, 2013. - File sizes must be suitable for printing at least 8”x10” (at 240 pixels/inch) or larger. Winning photographs will be posted online on Monday, October 7, 2013 at http://CherryHillArts.Blogspot.com. 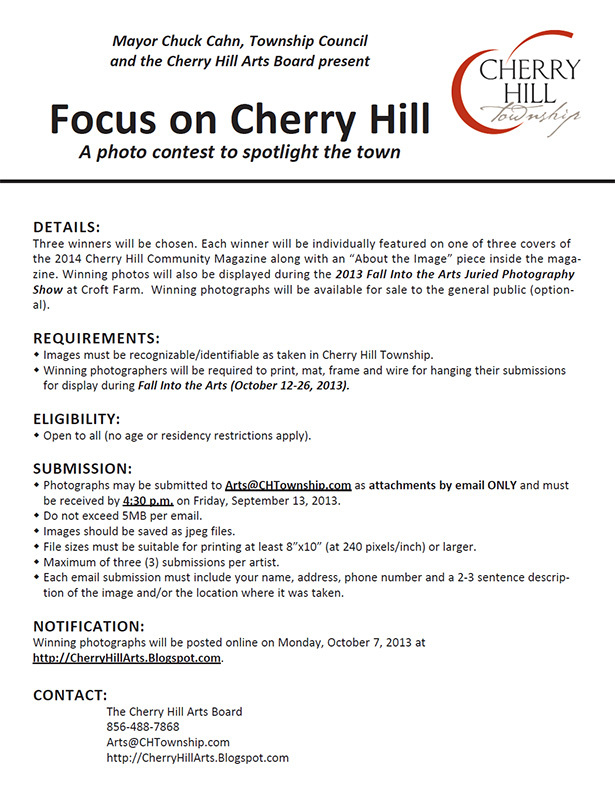 Focus on Cherry Hill - A photo contest to spotlight the town-Deadline: Sept 13, 2013- For details, email Arts@CHTownship.com or visit http://cherryhillarts.blogspot.com.